The shell ice maker is one of the products manufactured by Berg which finds extensive application in the commercial fishing, food processing, produce, meat and poultry industries. These industrial ice machines are available in models from 5 to 50 tons of cracked ice per day. Based on an old and proven principal of making ice on a tubular evaporator surface and harvesting it by gravity, the Berg Shell Ice Maker has become the industrial ice maker of choice in many areas and ice making plants. Water is automatically introduced into the oversized sump, via the water make-up valve. The water is then pumped through the flow control valve to the distribution headers from where it is sprayed onto double-walled stainless steel evaporator tubes. 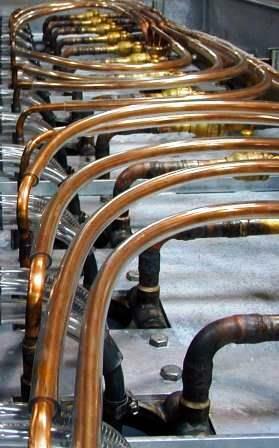 As the water cascades down the inner and outer surfaces of the evaporator tubes it gets chilled down to its freeze temperature. The free water that does not freeze onto the tubes falls through a perforated trough and back to the sump. 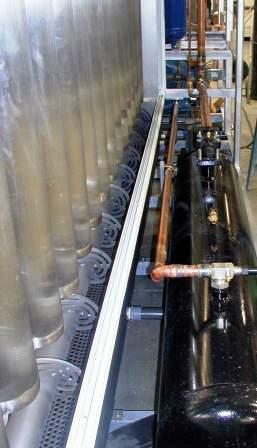 The chilled water is then pumped back to the water distribution header to cascade down the tubes again. After the ice has formed to the desired thickness (as selected by the operator/user), hot compressor discharge gas is redirected into the tubes using solenoid valves; displacing the low temperature liquid refrigerant. As the evaporator tubes warm up a thin film of water is formed between the ice and the evaporator tube wall allowing the ice to fall freely into a trough below. Any free water produced in the harvest cycle falls through the perforated trough and is returned to the sump preventing “wet” ice from being discharged from the machine. The discharge auger in the trough reduces the ice shells into finely divided, irregular shaped fragments and also delivers the ice shells from the machine to the storage room below or for immediate use. The free water falls through the perforated deck and back into the sump. The cycle then automatically repeats itself. Refrigerant condensing is achieved using either an air cooled, water cooled or evaporative cooled condenser. 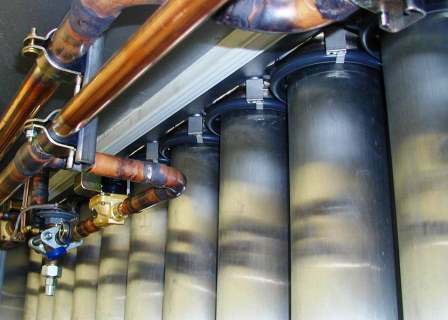 Remote air cooled condensers should be installed on a higher level than the machine whereas water cooled condensers are factory located on the lower front of the machine and pre-piped as a complete package. Where desirable, water cooled condensers can be cooled with sea water on shipboard and shore based operations. Evaporative cooling would be considered if the air ambient temperature was too high for efficient and economical use of either air or water cooled condensers. Sanitary requirements for these applications are paramount. Equipment must be stripped down and cleaned after each day’s production run. The construction of these 5-15-tons-per-day remote air-cooled ice making machines require major design modifications from our standard ice machines. All metal surfaces coming into direct food/plasma contact are constructed of stainless steel and all surfaces are given a glass bead finish. With a Berg industrial ice making machine, shell ice is made on both the inside and outside of a double tapered, stainless steel evaporator tube. During a timed cycle – normally between five and nine minutes long depending on desired shell ice thickness – ice is frozen and then harvested. The harvest cycle is between 30 to 90 seconds. This occurs when a refrigerant solenoid valve closes and a hot gas solenoid valve opens, rapidly warming the evaporator tube allowing the ice to slide off by means of gravity. After the ice slides off the tubes and fragments as it hits the bottom of a perforated trough, a stainless steel screw conveyor discharges the ice. 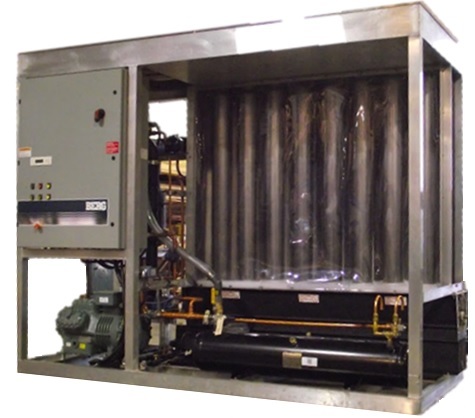 Unlike the majority of other industrial ice machines available on market, all the components on a standard Berg Shell-Ice Maker coming in contact with ice or water are all manufactured from stainless steel or food grade plastic. Berg industrial shell-Ice Makers are available in three basic designs – two air cooled and one water cooled. 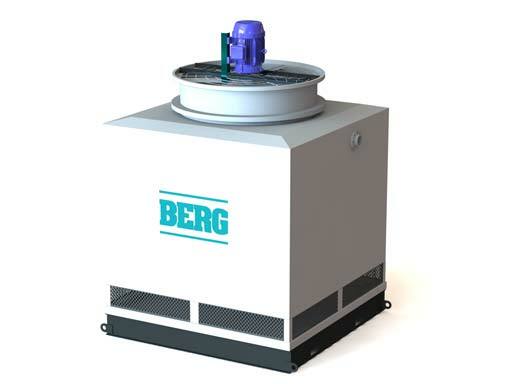 In addition to an air cooled model with a remote (rooftop) condenser, Berg offers two self- contained, packaged units – air cooled or water cooled – which require only the simple connection of suitable water and electrical supplies to produce ice. The water cooled models can be equipped with marine type condensers suitable for salt water operation. 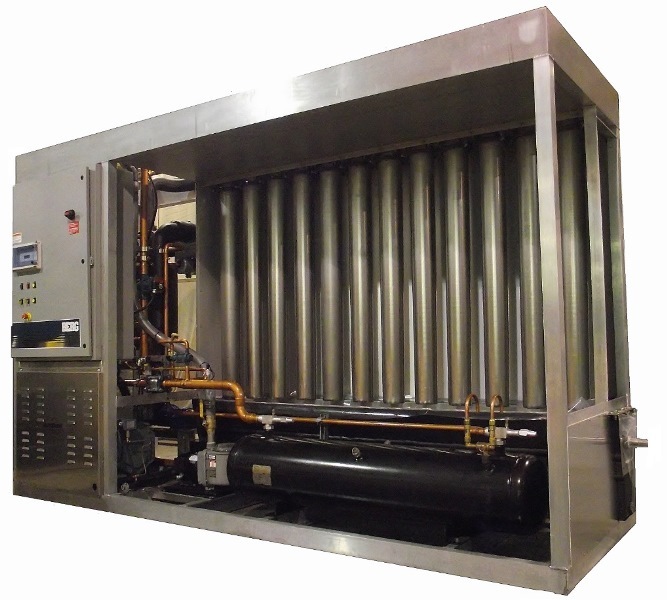 Standard air cooled models are equipped with copper tube-aluminum fin condensers. However, for units which are to be installed near the sea, all copper condensers are supplied at extra cost. Every Berg machine must meet specific ice capacity and quality standards before it is released for delivery to the client. 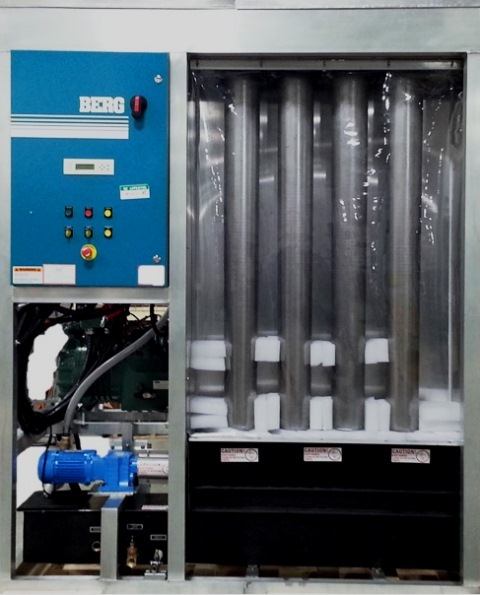 All Berg industrial ice makers are fully tested under simulated load conditions at our manufacturing plant to ensure they are delivered to the customer capable of producing the daily capacity they are rated for. At Berg we actually weigh the shell ice coming off the machine. Berg Shell-Ice Makers produce the most versatile ice. By simply turning a dial in the user-friendly control panel, the operator can vary the type of ice produced, in thicknesses from 1/8” to 5/8” or more, to suit their requirements. Since all the components coming in contact with the water and ice are manufactured from stainless steel or food grade plastic, a standard Berg Shell-Ice Maker will make ice from fresh, or salt water, with only the turn of a dial. Our findings and experience, as confirmed by independent research groups and users of Shell-Ice, show that Shell-Ice is a “better” ice. The versatility of being able to choose ice thickness can be very important for some operators – as can the choice of using a softer, colder salt water ice as opposed to a fresh water ice. Berg Shell-Ice Makers provide different ice forms for all types of applications. As well, Shell-Ice handles better than all other types of ice and keeps its superior handling characteristics for a longer period of time. 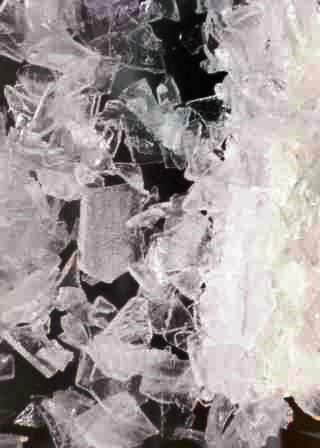 Seatech Investigation Services, Halifax, Nova Scotia, concluded in a recent study commissioned by the Federal Department of Fisheries and Oceans, that while flake ice was workable for 48 hours and crushed block-ice was found unworkable after only 24 hours, Shell-Ice was completely workable through the seven days of the study and could be easily handled and shoveled. Since most ice has to be stored for a few days before being used, it is important to be able to easily handle the ice from storage to where it is required. So, whether you require ice that is thick or thin, made from fresh or salt water, a Berg Industrial Shell-Ice Maker can meet all your requirements by varying the ice thickness as your individual needs change. The rugged industrial design of Berg Shell-Ice Machines allow for a long life with minimal maintenance. Unlike a flake ice machine which incorporates a moving drum or harvest knife which need constant inspection and adjusting, a Berg Shell-Ice Maker has no moving parts in the freezing zone. There is no worry that a harvest knife might gouge the evaporator drum, making it necessary to replace both parts. The major cost contributor when producing ice is the cost of electricity. A Berg Shell-Ice Maker produces ice more efficiently than other ice machines, requiring less electricity per ton of ice to operate. Depending on the particular model, Shell-Ice can be produced for as little as 40-43 kWh/ton – $2.50 to $3.00 per ton. As a comparison, flake ice requires an additional 20% or more electricity and ice purchased in bulk costs about $30.00 to $60.00 per ton – bagged ice can cost as much as $300.00 to $400.00 per ton. 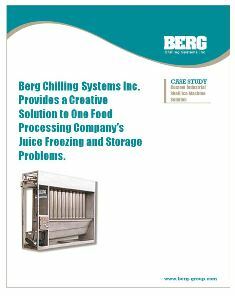 A Berg Shell-Ice Maker is the ideal way to satisfy your ice requirements. 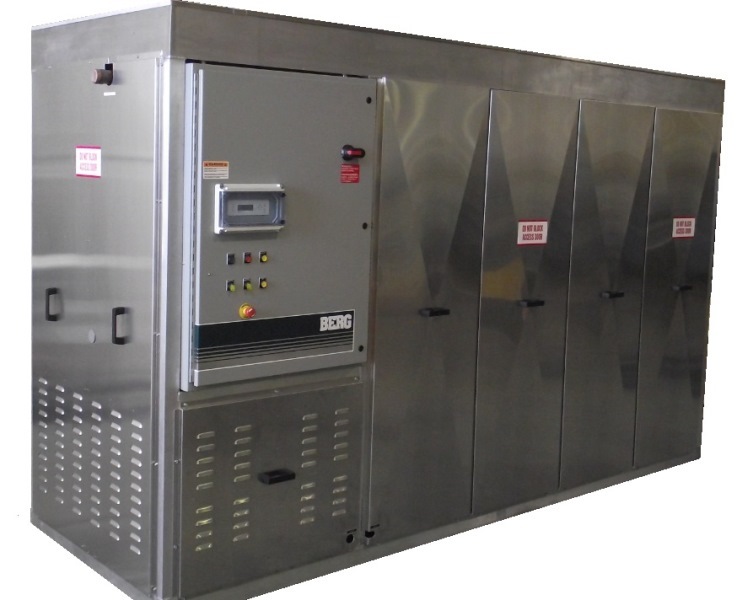 In addition to offering a reliable and efficient source of inexpensive ice, the user has the capability of matching the ice type produced to specific requirements. You can produce a more versatile ice with the best handling characteristics at a lower cost per ton. Shell-Ice the better ice.